Gangtok, 18th December : (IPR) Shri Chewan Prasad Dhakal, Retired Secretary to the Government of Sikkim, was sworn in as the State Information Commissioner of Sikkim at a function held at Ashirwad Hall, Raj Bhawan today. 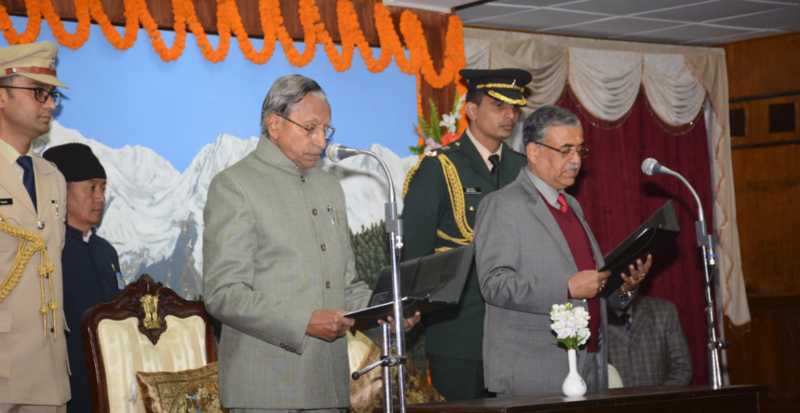 Hon’ble Governor of Sikkim, Shri Ganga Prasad administered the oath of office to the State Information Commissioner Designate in the esteemed presence of Hon’ble Chief Minister of Sikkim, Shri Pawan Chamling, Hon’ble Speaker Sikkim Legislative Assembly Shri K.N. Rai, Cabinet Ministers, Chief Secretary and senior officers of the State administration. After signing of the oath/affirmation relating to his assumption of office and attestation by the Hon’ble Governor, the State Information Commissioner was congratulated by all the dignitaries and guests present. 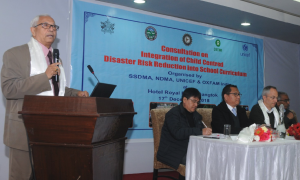 Gangtok, 17th December : (IPR) A State Level Consultation on Child Centred Emergency Preparedness for Response was held in the capital today. The inaugural session was presided over by Mayor Gangtok Municipal Corporation Mr Shakti Singh Choudhary. Organized by the Sikkim State Disaster Management Authority (SSDMA) in collaboration with UNICEF, NDMA and OXFAM, India, the programme had the eminent presence of Mr Lars Bernd, Chief Emergency Officer at UNICEF, Mr Rinzing Chewang , Special Secretary LR& DM Department Government of Sikkim, Mr B.B.Subba, Special Secretary, Govt. of Sikkim, Dr. Rabin Chettri, Director SCERT HRDD, and Dr.Vinod Sharma Vice Chairman, SSDMA. 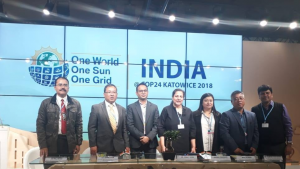 The Workshop also had the participation of Principals of various schools, students, representatives from Departments of Government of Sikkim and various agencies. Mayor GMC Mr Shakti Singh Choudhary, in his inaugural address, highlighted the steps taken by the State Government in tackling any disaster situation in the State. He impressed upon the various projects and programmes initiated by the Government in coordination with various line Departments and organizations to reduce the risk of Disaster. While addressing the session, UNICEF India Chief Mr Lars Bernd said that the concentration on relief and mitigation is of utmost importance. He added that equitable distribution of safe and adequate resources, usages of technologies and ecological restoration is very important to reduce the risk of disaster. Appreciating the initiatives taken by the State in disaster risk reduction, he stated that more focus needs to be laid on quality and quantity based work. He also spoke about various aspects of School Safety and to build new skills in schools, to empower children inside and outside the Schools during Disaster and to sensitize them for sustainable development. 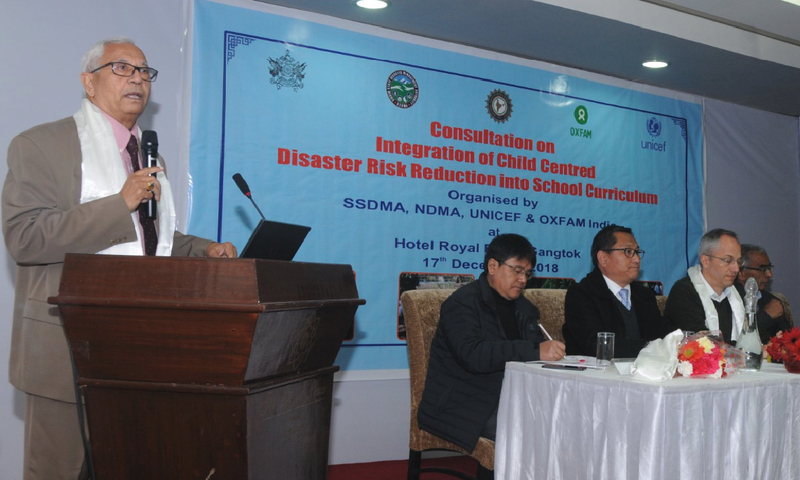 Earlier, Dr. Vinod Sharma, Vice Chairman SSDMA, in his welcome address, congratulated the Department for organizing the workshop in the State of Sikkim and assured to continue such programmes in future which can be helpful to achieve the goal of the Chief Minister to make Sikkim a Model State in the area of disaster risk reduction. The inaugural session concluded with vote of thanks proposed by Mr G.C. Khanal, Additional Director, LR&DMD, which was followed by the technical session. Poland, Dec 8: COP 24 is the informal name for the 24th Conference of the Parties to the United Nations Framework Convention on Climate Change (UNFCCC). The UNFCCC entered into force on 21 March 1994. Today, it has near-universal membership. The countries that have ratified the Convention are called Parties to the Convention. Preventing “dangerous” human interference with the climate system is the aim of the UNFCCC. 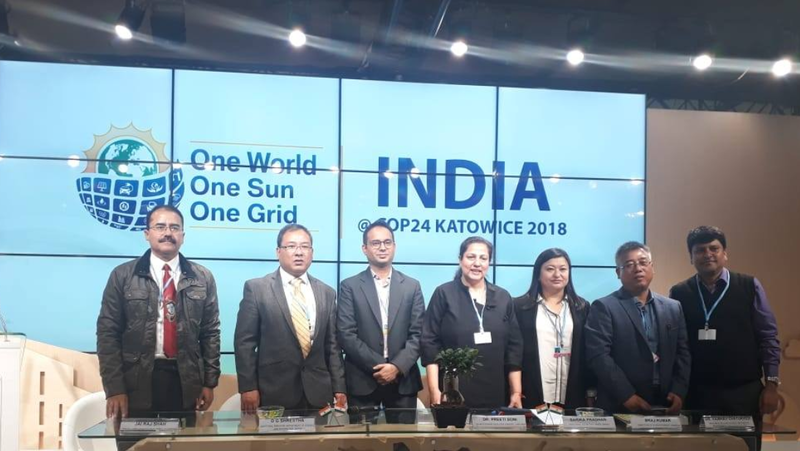 COP24 is taking place from 2-14 December 2018, in Katowice, Poland. This year, Government of Sikkim is invited by United Nations Framework Convention on Climate Change to present successful case studies under United Nations Development Programme – Swiss Agency for Development & Cooperation Project on Strengthening State Strategies for Climate Actions. Government of Sikkim has been taking laudable initiatives in the field of Dhara Vikas and Glacial Lake Outburst Floods (GLOF) mapping and mitigation measures. The Departments of Rural Management & Development, Science, Technology and Climate Change along with Land Revenue & Disaster Management have been continuously working toward making Sikkim achieve the Sustainable Development Goals as has been envisioned by the Chief Minister. This has also been recognised by the international experts and scientists of related fields. Shri. D.G. Shrestha, Additional Director, Department of Science, Technology & Climate Change will present a case study on Reducing Climate Induced Risks and Vulnerabilities due to probable Glacial Lake Outburst Flood (GLOF) at South Lhonak Lake, North Sikkim. UNDP – SDC project successfully piloted a siphoning project to reduce the level of water from South Lhonak lake in collaboration with Sikkim State Disaster Management Authority, Land Revenue & Disaster Management Department. Smt. Sarika Pradhan, Additional Secretary, Rural Management Development Department is presenting a talk on Story of Dhara Vikas – Revival of Springs. The UNDP – SDC project is assisting RMDD with scientific and technical support for monitoring the discharge of springs. The UNDP – SDC Project is further assisting Government of Sikkim in Mapping Forest Wildlife Corridors, Mapping Invasive Species of the State, Preparation of Hazard Risks and Vulnerability Maps of Mangan, Gyalshing and Namchi, Preparation of State Wetland Atlas, PRA mapping exercise for 16 Model Disaster Resilient GPUs and other related activities.